The center chapter of the Bible (Psalm 117) and center verses of the Bible (Psalm 103:1-2) and other numeric map evidences authenticate there are no missing books, chapters or verses of the Bible. Adding any chapter or verse to the Bible would change the middle chapter or verse to locations that don’t make sense. 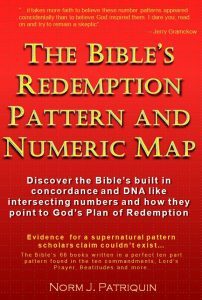 The Bible’s Redemption pattern is a precise pattern all the writings of the Bible are structured after, and its associated Numeric Map is the discovery of a perfect numbered structure in God’s word that proves it could only be a product of supernatural origin (see home page for more details). Every book, chapter, verse as well as cross-Bible chapter and verse numbers all are precisely numbered without any break in sequence – all the numbers having themes that line up with the text. This pattern validates the Bible (KJV, NASB, NIV,…) was likely created by God through the men that wrote it. Even though we know men wrote, canonized and numbered the Bible, it seems God was the invisible force influencing every letter that was written. Psalm 117 is the exact middle chapter of the Bible and is the shortest and only two verse chapter with both verses declaring “Praise the Lord“. 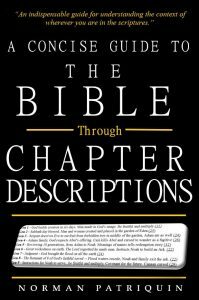 It is a very unlikely happenstance that this unique chapter finds itself in the 595th chapter position of all 1189 chapters of the Bible. How did it get there? Matthew 24:42 is the 24,000th Bible verse at the intersection of six different associations to the number 24 as well as being directly related to the “Day” of the Lord: #1) The chapter Matthew 24 is about the Day of the Lord; #2) a day has 24 hours; #3) the chapter number is 24; #4) the verse text at this location refers specifically to the “Day” of the Lord “…be on the alert, for you do not know which day your Lord is coming.“; #5) the number of this verse 42 is number 24 in reverse; #6) and most amazingly…this is the 24,000th verse of the Bible. If you dismiss these as likely coincidences, there is a long list of other such evidences to consider dismissing as well (see below link). These evidences point to a supernaturally created Word of God and validates the Bible is perfect and complete from the first verse to the last. This web site explains the perfection found in God’s Word revealed by Redemption Pattern and Numeric Map. But what does it say about the possibility of there being a “Secret gospel of Mark”? I suspect if there are secret messages of the Bible, they are already right before our eyes in the text, but not necessarily on the surface where they can be easily seen. The perfect and unbreakable numbering of the Numeric Map seems to prove there can be no other book of Mark that would fit in this location while still preserving the integrity of the Numeric Map. There are scholars that seem to think there might have been such a gospel, but it has never been found. Maybe there were other books of Mark written and maybe God made sure they could not be found? If you study the evidences for the Numeric Map I think you will agree there is no other versions of any book or any other writings that should be part of the Word of God. Press this link for compelling evidences for the Numeric Map – Redemption Pattern and Numeric Map compelling evidences.